Get your own dedicated Marketing Executive who does everything for your business. It's like having your own marketing director! Call, email or text them whenever you’d like. Their goal is to grow your business. Marketing today is extremely complicated and time consuming, so it’s key to have a digital marketing specialist dedicated to your success. Hiring a skilled in-house digital marketing specialist can be extremely expensive. With Marketing 360® you get that person without the overhead. Marketing is always changing and evolving. Your Marketing Executive helps you stay ahead of the curve and see around the corner. All our Marketing Executives are extremely passionate about helping their clients grow their business. Watch this video to get to know us and how our team is driven to provide results and a world-class customer experience. Your dedicated Marketing Executive does everything for you. They’re like your own marketing director! Call, email or text them whenever you’d like. Their goal is to drive you results &grow your business. All our Marketing Executives are highly trained & skilled in digital marketing. 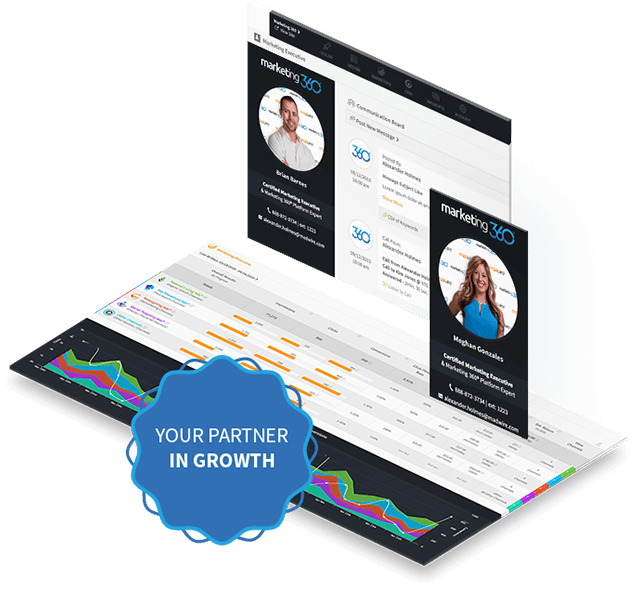 Your Marketing Executive will provide you with weekly reports and access to Marketing 360® to review any report you’d like 24/7. Beyond that you can call, email or text them wherever you’d like for whatever you’d like. Our #1 goal is to drive you results so we want to make sure we’re on the same page to ensure we’re doing that. Your Marketing Executive will work hard to make sure you’re highly visible on the best marketing channels for your business, including Google, Facebook, Instagram, YouTube & more. Your Marketing Executive will make sure we constantly design fresh eye catching ads and optimize your listings so they stand out over your competitors. Your Marketing Executive will make sure to optimize your campaigns so they drive the most leads & sales possible and help you capture market-share from your competitors. Your Marketing Executive will make sure to fully understand your business & your goals so they can provide you the tools & talent you need to scale & grow your brand. Your Marketing Executive will track everything and provide you with constant updates and results so you can track the performance with ease. Your Marketing Executive will help analyze competitors and keep you updated with shifts in the marketing so you can stay ahead of the curve. Your Marketing Executive will keep an eye out for opportunities for additional growth and ways you can capture more market-share and increase sales. Your Marketing Executive will treat your business as their own and truly work to become your trusted partner in the growth of your brand. You start with a kickoff call between you and your dedicated Marketing Executive so they can gain a full understanding of your business and overall goals. Once your Marketing Executive understands your goals and your budget, they will research what marketing strategies/plan will drive you the best results. 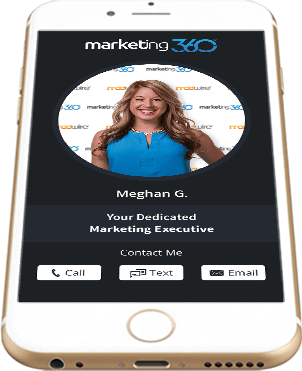 Once you approve the plan, your Marketing Executive & their team will setup & launch everything for you and show you how to access & track it all in Marketing 360®. Your Marketing Executive stays in constant communication and provides feedback, advice and ideas on ways you can further grow your business. Your Marketing Executive will help ensure their team is providing you the highest quality of work, whether that be via design, content, video or more. Your Marketing Executive will constantly analyze your campaigns and make improvements based on data in order to drive you the best return on investment over time.